Romania has a second unicorn after UiPath, as eMAG has been evaluated at over USD 1 billion by its main shareholder Naspers. 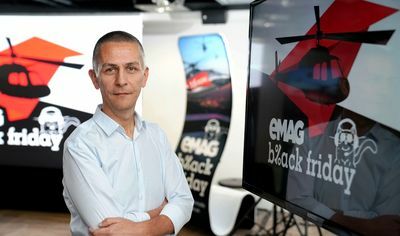 eMAG CEO Iulian Stanciu told Business review that this was a goal he had set for the company from the very beginning. According to Iulian Stanciu, CEO and minority shareholder of eMAG, the business is evaluated every year by annalists. “The solid base we created through technology and experienced employees gives us great growth opportunities”, the entrepreneur told Business Review. “I knew from the beginning that eMAG could grow into something big. Since I came to eMAG I’ve been telling people that I wanted it to be a billion-dollar business. They said, you’re crazy! We have too many problems! We were losing clients, services were not great, but a few things were very good: Radu Apostolescu, who created the brand, was a visionary, as he built it to be the customer-oriented. Bogdan Vlad, another founder, the one who built the back-end technology, also had a visionary approach. To their visions I added my knowledge of finance and leadership. The major growth is mainly due to the funding that eMAG has received. We got USD 200 million in funding from Naspers in exchange for a majority share package. You can do a lot of things with this kind of money,” said Iulian Stanciu for Business Review. eMag is a Romanian company founded in 2001, a pioneer of the Romanian online market, which also has a presence in Bulgaria, Hungary and Poland. For 17 years, the company has been constantly investing in technology-based services developed in Romania that help customers save time and money. The company was not affected by the economic crisis, thanks to the cost cutting measures they took before consumption dropped. “We preemptively cut spending and orders by about 30 percent. The market was down 60 percent. But in 2009, when our competitors had historical crashes, we grew 10 percent,” said Stanciu, talking about the economic crisis. eMag became the leader of the electro-IT market, surpassing its main competitor Altex in terms of sales. It is also known for the Black Friday event it introduced to Romania several years ago, which is now used across the entire retail sector. “Entrepreneurship is like magic: you put in the work, you put in the capital, and what comes out of it does good things both for the community and for the company,” says Stanciu. Iulian Stanciu also told Business Review that eMAG would continue its development by introducing new services and expanding to new markets in the Region. “This is what will bring us the next billion”, the entrepreneur added.